Looking for the definition of Mother? 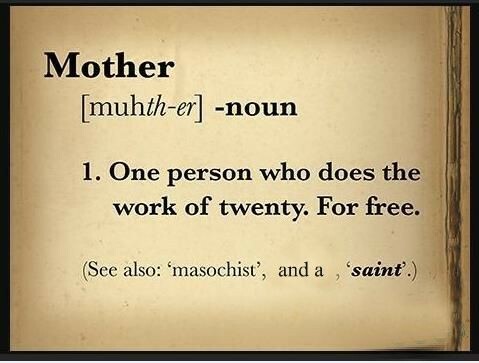 Mother – one who does the work of twenty. For free. Oh them kids – how I love them. We are on day 12 of the kids being out of school. So far no one has run away nor accidentally called 9-1-1. Just a mild stomach bug, but we’re surviving. This week has made me officially feel like a mother, more than any other time in my 8 years of doing this. I’m not sure if it’s the 20+ clothes of laundry I’ve been washing and folding or the 5 times a day that I have swept the floor. Everything still feels sticky no matter how much cleaning is done. I keep waiting for the camera crew from Hoarders to knock on my door for an intervention. Just in case, we aren’t answering the door until this house is clean. Parenting Tip: When you have 4 kids and 2 under 2 – just forget about a clean floor.